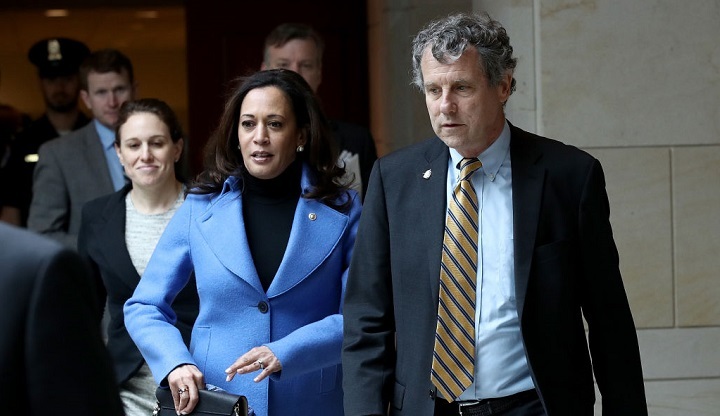 Sen. Kamala Harris (L) (D-CA) and Sen. Sherrod Brown (R) (D-OH) arrive for a military briefing in Washington, D.C. in 2017. Brown and Harris each accepted six-figure amounts from corporate political action committees during their most recent campaigns. By one progressive yardstick, the 10 potential and current candidates for the 2020 Democratic presidential nomination who have run federal campaigns during the last decade are pretty much who people thought they were. Discomfort among progressive voters -- a key constituency in early Democratic presidential primary contests -- hasn’t stopped all potential 2020 candidates from taking corporate PAC money. Sherrod Brown, the ranking minority member of the Senate Banking, Housing, and Urban Affairs Committee who also has a seat on the Senate Finance Committee, reported receiving the most corporate PAC donations of any potential candidate. The Ohio Democrat, currently touring early primary states and expecting to announce whether he’s running by March, recorded almost $830,000 in donations from corporate committees during his 2018 re-election campaign. Cory Booker, a New Jersey Democrat, received more than $295,000 from corporate PACs during his successful 2016 re-election campaign. Booker signaled his intentions to stop taking corporate PAC money in a February 2018 tweet made only hours after Gillibrand’s tweet. This story was produced by MapLight and published in partnership with Splinter.